When was the last time you reviewed your property portfolio including assessing its cash flow, annual capital growth as well as all expenditure and tax deductions. 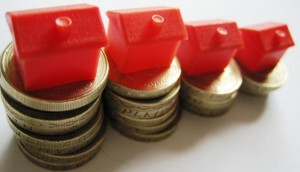 Unfortunately, too many property investors don’t make the most of one deduction– depreciation. While you can only claim depreciation at the end of each financial year, it’s important that you understand what deductions you may be entitled too, as they can significantly assist with your cash flow. 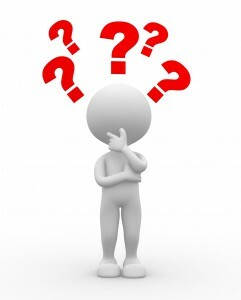 So what are four of the major insights that you need to understand when it comes to depreciation? It’s important to keep on top of all repairs and maintenance expenditure during the year. A good way of doing this is to itemise all repairs and maintenance repairs on a spreadsheet as and when they happen. By recording these expenses, including what type of repair it was such as a new hot water cylinder, your tax accountant will be able to easily identify which expenses are depreciable and which are immediately deductible. 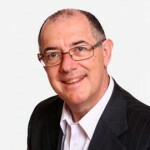 Of course that not all depreciation allowances can be claimed at the same rate or over the same timeframes. These are generally dependent on what type of repair was undertaken in the first place. It’s also a good idea to provide more information than less when recording any repair and maintenance expenses to ensure you can maximise your depreciation claim. Many investors think that a property constructed more than 30 or 40 years ago doesn’t warrant a depreciation schedule, but this is not always the case. 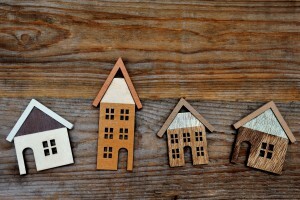 While generally it’s only properties that were constructed after July 1985 that can claim depreciation, older investment properties that have been renovated or extended since that time can also claim deductions. This makes sense, of course, because how many properties that are 30 or more years old are in completely original condition? Most have benefited from new kitchens and bathrooms at least in more recent times to bring the property up to modern standards. Whether you made the improvements yourself, or the renovations were the work of a former owner, there may be something that you claim because of new fixtures and fittings. If you renovate or improve you are entitled to write off any unclaimed depreciation on the fixtures and fittings being thrown out or indeed part of the building if being demolished. To claim this write off you will have needed to have used the premises as an investment property and prior to the work being carried out generated taxable income i.e. rent. This expense wouldn’t normally be available before your first tenant. The scrapping schedule can be prepared by a quantity surveyor or the amounts can be identified from the existing depreciation schedule, which would show amounts not yet claimed on the item/s. The good news is that, if you fail to make a claim in a particular year, it doesn’t mean that you’ll never be able too. You are able to access up to two years’ worth of deductions so it’s important to not leave it too long, otherwise you could miss out on some significant depreciation benefits. That’s why it’s so important to organise a depreciation schedule for your investment property sooner rather than later. Ideally, you should organise for a schedule to be completed by a quantity surveyor shortley after settlement, which you can then give to your tax accountant to calculate your depreciation deductions every year from the same document. You can then use the same schedule for the life of the property – unless your property undergoes a renovation, which will require you to have a new depreciation schedule compiled so you can take advantage of any new deductions that the refurbishment has created. So there you have it: 4 ways you can use depreciation to maximimise the returns on your investment properties. How can this apply to you? 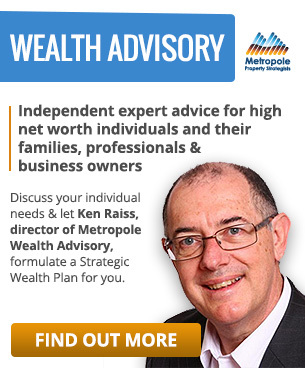 Why not discuss your individual needs and let Ken Raiss, director of Metropole Wealth Advisory, formulate a Strategic Wealth Plan for you, your family or your business? 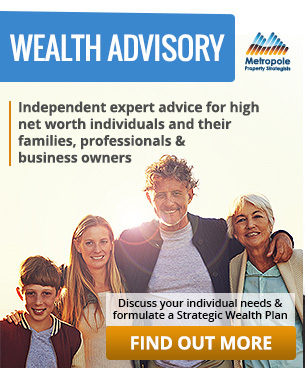 Remember attaining wealth doesn’t just happen – it’s the result of a well executed plan so please click here and find out more about our services. Using our depth of skills in these core disciplines, we adopt a coordinated project management approach and access other specialists as needed to further enhance our integrated advice solution.